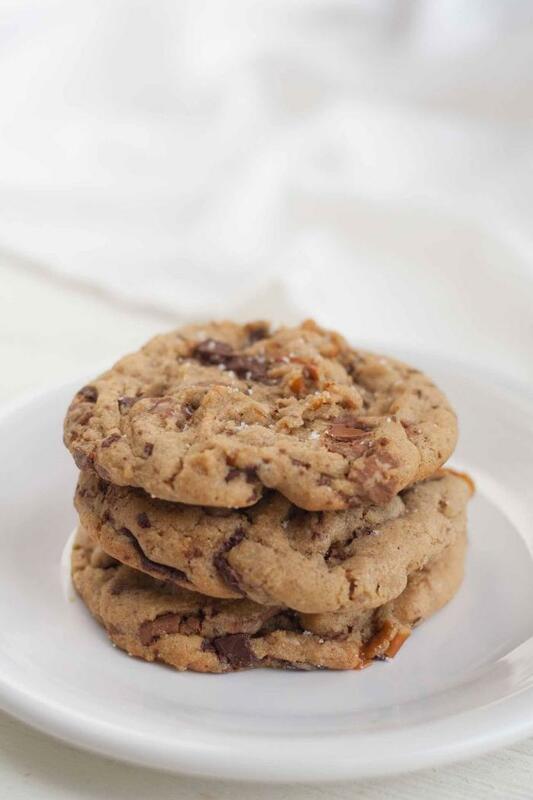 A chewy, buttery cookie loaded with milk chocolate, dark chocolate, caramel, and pretzels. 1Whisk together flour, baking soda and salt in a bowl. Set aside. 2Beat together softened butter, brown sugar, and white sugar with an electric mixer. Beat in vanilla, egg, and egg yolk until creamy. 3Mix in the flour mixture in three additions and stir just until the dough comes together. 4Add milk chocolate chunks, dark chocolate chunks, mini pretzel pieces and caramel pieces and stir into dough by hand. 5Cover and refrigerate for several hours up to 24 hours. 6Preheat oven to 325 degrees. 7Line baking sheets with parchment paper. Drop cookie dough in golf ball sized balls onto the cookie sheet, leaving several inches in between each dough ball. 8Flatten dough balls slightly and sprinkle with the flaked salt. 9Bake for 10-15 minutes* or until the edges are turning golden brown. Remove from oven and cool on the baking sheets for several minutes before transferring to a wire rack to cool. Baking time depends on the size of the dough balls and if you are baking them straight from the refrigerator or from room temp.